ARE CHRISTIANS GUILTY OF IDENTITY POLITICS? The social upheaval that has characterized America over the past decade is closely related to the rise of what is known as “identity politics” – the practice of organizing a distinct social or political constituency around a cause, a sense of threatened existence, the perceived loss of opportunities or influence, or a set of ideals. A number of movements have emerged to challenge society’s prevailing traditions, beliefs, customs, and laws based on claims of discrimination related to race, sexuality, ethnicity, economics, and spirituality. The recent, ugly events in Charlottesville are simply the latest in the increasing number of incidents sparked by identity politics. As the nation’s political polarization approaches perilous heights, Americans have ample reason to feel endangered by this practice and to demand that our leaders address these issues with wisdom and courage. A new national survey conducted by the American Culture & Faith Institute, under the direction of George Barna, looked at peoples’ perceptions of various population groups and discovered numerous areas in which prevailing beliefs about our population are wrong or questionable – and could result in violent or conflict situations. Overall, Americans are more likely to be troubled by matters related to economics, healthcare, and governance than by racial tensions. 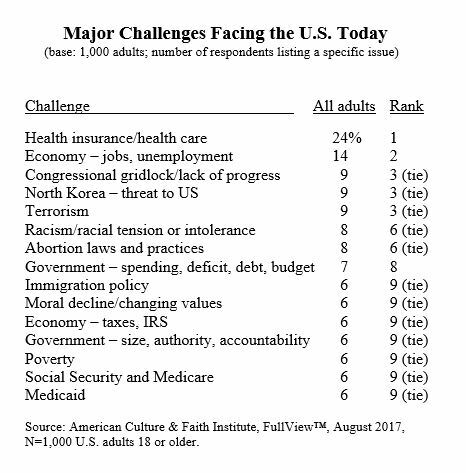 The survey of 1,000 adults from across the nation revealed that the top-rated challenges facing America are perceived to be healthcare (mentioned by 24%); employment and jobs (14%); Congressional gridlock (9%); terrorism (9%); and the North Korean threat (9%). The sixth-ranked challenge was racism and racial tension (8%), along with abortion (8%). A somewhat different picture of Americans’ priorities emerges when challenges in the same category of issues are combined. For instance, national defense concerns – incorporating the likes of terrorism, addressing Islamic aggression, and threats from China, Russia, and North Korea – combined to represent 21% of the responses. Economic issues – including matters such as taxes, economic growth, jobs, income inequality, declining work ethic, Social Security, and reducing poverty – were the second-highest category. Overall, 16% of the challenges listed by respondents were economic matters. Trailing those categories were healthcare issues (15%), governance challenges (11%), moral challenges (7%), and various other categories. Past sociological studies have shown that negative feelings toward a people group are sometimes founded on a sense of feeling threatened by that group. One common reason for that perception of threat is the size of the group in question. 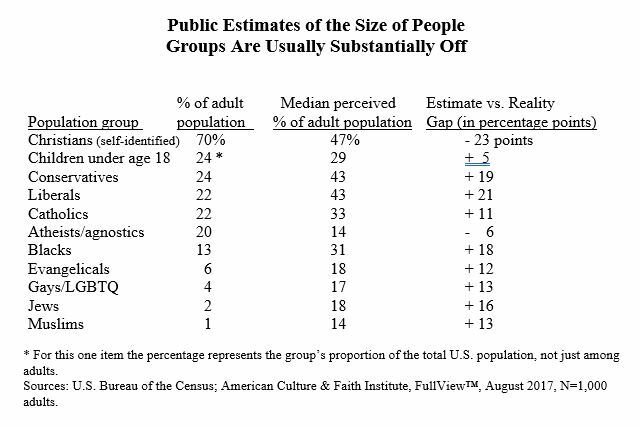 The ACFI survey reveals that Americans often have a skewed sense of the size of people groups. The survey asked respondents to estimate the approximate proportion of the adult population that a specific segment represents. The public was off-base in its estimates in relation to nine of the 11 groups studied by at least 10 percentage points. In eight of those nine cases, the public significantly over-estimated the size of the group in question. Self-identified Christians constitute 70% of the nation’s population. While that is down from about 80% who claimed to be Christians just two decades ago, it is considerably higher than the 47% that adults estimate to be Christians in the nation. 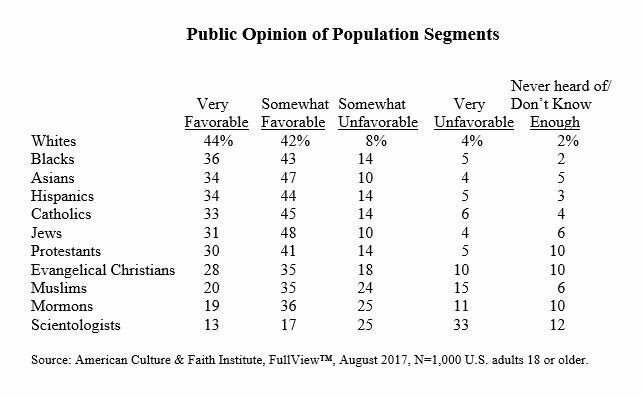 The fact that most Americans believe that less than half of the population considers themselves to be Christian has major implications for people’s faith and morality choices. Other minority segments – such as blacks and the LGBTQ group – are also radically overestimated. People believe there are about four times as many gays as actually exist, and contend that there are twice as many blacks presently live in the US. The same distortions exist in regard to the politics of Americans. While people who possess a moderate ideology comprise a majority of the population, adults believe that liberals and conservatives each represent close to half of the population (each group is estimated to be 43% of the adult public). In reality, each of those ideological groups are only about half as commonplace as assumed. The survey evaluated peoples’ opinions of 11 different population groups. Overall, a majority of people hold a positive view of 10 of those 11 groups, the exception being Scientologists. At the same time, the survey discovered that none of the 11 segments studied are viewed “very” favorably by a majority of the public. Opinion toward most groups is most likely to be mildly positive. The survey results also point out that adults are more likely to have positive views of racial and ethnic groups than they do of religious groups. The four racial and ethnic segments examined had higher favorability ratings than did any of the seven religious groups monitored. Overall, whites received the most positive evaluations from the population – which may not be a surprise since 61% of the adult population (and of the survey base) are white. In total, 86% held favorable views of whites. Not far behind were black people, of whom 79% of adults have a favorable opinion. A similar proportion of respondents (81%) had a favorable view of Asians living in America, while 78% had positive views of Hispanics in the U.S. The most positive perceptions of religious groups tested included Jews (79% favorable), Catholics (78% favorable), and Protestants (71% favorable). Less positive scores were accorded to evangelical Christians (63%), Muslims (55%), and Mormons (55%). The lowest score – and the only group that garnered a favorable rating from less than half of the adult population – was Scientologists, which was viewed favorably by only 30%. Scientologists have clearly struck a chord – and not a good one – with a large share of Americans. They are the only group of the 11 evaluated which generated a “very unfavorable” rating from more than one out of every seven Americans. The survey found that one out of three adults (33%) had a “very unfavorable” view of Scientologists, while an additional one-fourth (25%) held a “somewhat unfavorable” view of the group. Only two other groups – Muslims and Mormons – received unfavorable ratings from more than two out of ten adults. In total, 39% had unfavorable views of Muslims, and 36% had unfavorable views of Mormons. When the data are looked at according to the faith preference of the survey respondent, the ratings change substantially. 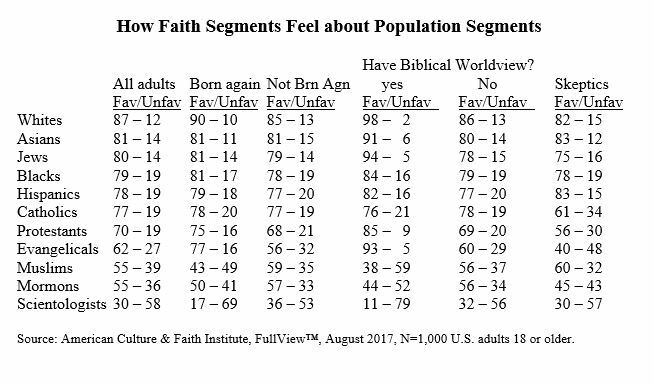 Born again Christians were notably more positive toward evangelicals but less favorable toward Muslims and Scientologists. Those who are not born again had a more positive view toward Scientologists and a more negative perception of evangelicals. One out of every ten adults possesses a biblical worldview. Known as Integrated Disciples, that segment is more likely than most Americans to have a favorable view of whites, Asians, Jews, Protestants, and evangelicals. They are more likely than other adults to have an unfavorable opinion of Muslims, Mormons, and Scientologists. Skeptics – those who are atheist, agnostic, or have no interest in religion and spirituality – are more likely than the typical adult to have an unfavorable view of Protestants, Catholics, evangelicals, and Mormons. Americans who align with a non-Christian faith are more likely than average to be favorable toward Muslims and less likely than average to have a favorable view of Protestants, Catholics, and evangelicals. Every segment of society has its fans and its detractors. If it is true that a negative opinion of a group is a precursor to tangible opposition directed toward that group, then the survey may help us to identify where such opposition is most likely to come from. In summary form, here are the population groups that have the most negative opinion of the specified group, and are thus most likely to provide opposition in some form. Asians: the least favorable opinions of Asians are held by Millennials, Catholics, and residents of the Northeast. Blacks: the greatest level of unfavorable opinion of blacks comes from conservatives, residents of the Northeast, Republicans, and people not registered to vote. Hispanics: the least favorable views of Hispanics are held by conservatives, Republicans, and blacks. Jews: the groups with the most negative opinions of Jews in America are Millennials, Democrats, blacks, LGBTQ, and people who are not registered to vote. Muslims: Muslims are held in the lowest esteem by conservatives, Republicans, Integrated Disciples, and the elderly. A reasonable question raised by these survey findings is how people have drawn their conclusions about the various population groups. The data persuasively show that millions of Americans are ill-informed about the size of most of the people groups studied. It is equally likely that Americans consistently draw erroneous conclusions about the people represented in other groups – misperceptions that could certainly lead to behavioral biases. One of the primary ways through which Americans are led astray about people who are different from themselves is by bias in media coverage. Adults are well aware of such bias but are often unable to discern the truth about a situation or group. In essence, the media describes reality for the public, and people feel as if they have no alternative source of insight into the conditions or people described in media reports. The survey examined the perception of media bias against six of the religious groups studied in the earlier portion of the research. The outcome was that, on average, about half of all adults (46%) believe that the coverage of the six largest religious groups in the U.S. is inaccurate and unfair. Overall, born again Christians were most aware of bias in reporting about Christians (56% said media coverage of Christians is regularly biased), evangelicals (52%), and Jews (52%). Integrated Disciples and political conservatives not only identified substantial bias against those three religious segments but also against Catholics. The research described in this report is drawn from FullView™, a nationwide survey with a randomly-selected sample size of 1,000 adults, age 18 or older, whose demographic profile reflects that of the adult population. The online study was conducted by the American Culture & Faith Institute during August 2017.